Vancouver and the west coast region is known for its high yearly rainfall count and this is especially true during the winter and spring months. It is during these periods of high rainfall that roofs are put to the test and are more susceptible to creating leaks in your home. Older roofs, improper installation of new roofs as well as poor drainage are the main culprits for leakage to occur which may result in the damage of your interior property; ceilings, walls, insulation, structure and even damage to your personal property such as your new big screen TV. At Incredible Restorations we have worked on hundreds of projects rebuilding properties damaged by roof leaks. Our field technicians are industry professionals equipped with water damage detection tools to effectively assess the source of the leak and make prompt and knowledgeable recommendations to minimize damage to your property. 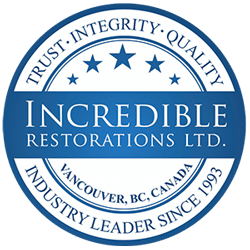 Call Incredible Restorations immediately, we are available 24/7 to confidently assist you in mitigating water ingress damaging your property caused by roof leaks. It’s our duty to assist you with the highest level of professionalism and customer service. We are very understanding of these stressful situations when water is damaging your property’s building materials, furniture, and prized possessions. As a recognized premium restoration service provider, it’s our responsibility to deliver excellent service throughout the mitigation and rebuilding of your home.